This December sees our very first 'Sleigh2Give' campaign in partnership with our friends at Sainsbury's Didcot as we strive to bring some smiles and extra special cheer this festive season for two very good causes. 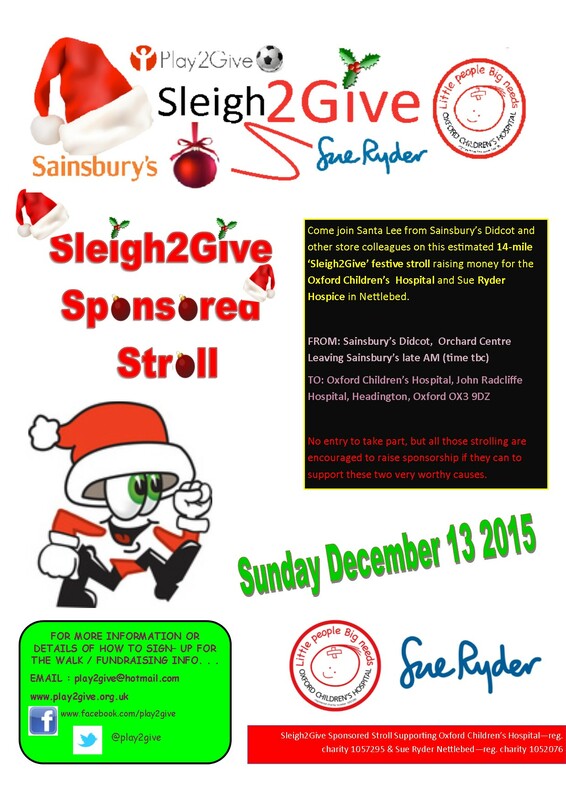 Why not join us and staff from Sainsbury's Didcot on a festive feel 17-mile sponsored stroll and help Sue Ryder Hospice in Nettlebed and the Oxford Children's Hospital? ​The store's nightshift worker Lee Crook will be leading the way dressed as Santa, and you can also take part too! The walk sets off from the store in the Orchard Centre early morning and will take in the most safest route with Santa and his army of helpers in tow with a bucket for extra coffers from passers-by, arriving to the Children's Hospital around 12pm. There is no entry fee to join in the festive fun of this walk, but strollers are encouraged to try to raise some sponsorship if they can from family and friends and colleagues. Fancy dress is optional. ​We are delighted to be running our very first Christmas Toy Appeal with our friends at Sainsbury's Didcot collecting donations to bring extra special cheer to sick children in hospital. We are asking for donations from customers into our trolley in situ in the store towards our amnesty. 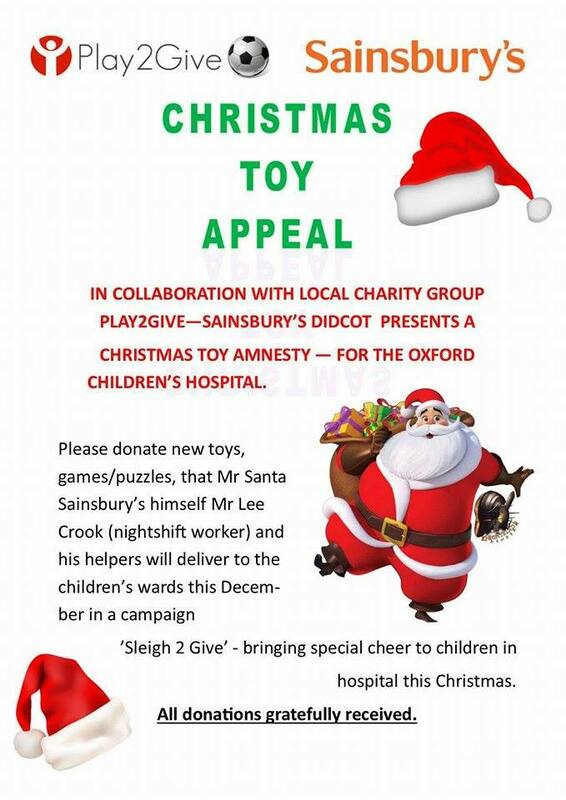 All donations of new and unused toys, puzzles and games that would brighten up the stay of children unfortunate to be in the Oxford Children's Hospital this Christmas. ​Santa Lee and a small group of workers from the store, including our very own Mr Play2Give Andrew Baker, will then deliver the sack full of goodies to the wards just before Christmas on December 23rd. This appeal is also supported by KIDACTIVE Oxford, Performing Angels & Stars Stage School & William Southby Lodge Harwell.